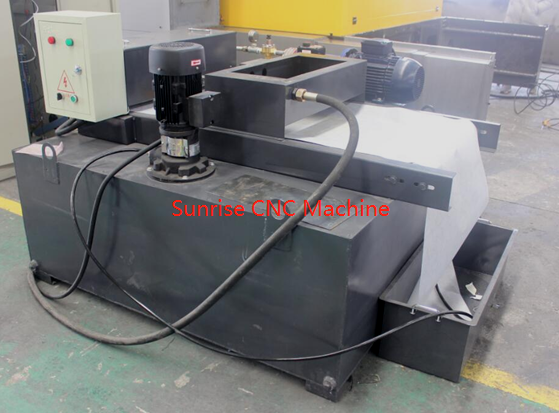 Product categories of Drilling Machine, we are specialized manufacturers from China, Drilling Machine, High Speed CNC Drilling Machine suppliers/factory, wholesale high-quality products of Gantry Type Drilling Machine R & D and manufacturing, we have the perfect after-sales service and technical support. Look forward to your cooperation! Mainly used for drilling tube plate, clapboard, flange and large plate in petrochemical, boiler, wind power, flange industries and also for connection plates in building, bridge, heat exchange, iron tower industries. 1. Heavy-load linear roller guide pairs are equipped on two sides of the machine bed respectively. The longitudinal movement of the gantry`s two sides is driven synchronously via AC servo motor and precise ball screw pair of big pitch. 2. Two movable slides are equipped on the cross beam of gantry. The sliders are guided by two linear roller guide pairs and driven by AC servo motor and precise ball screw pair of big pitch respectively. 3. 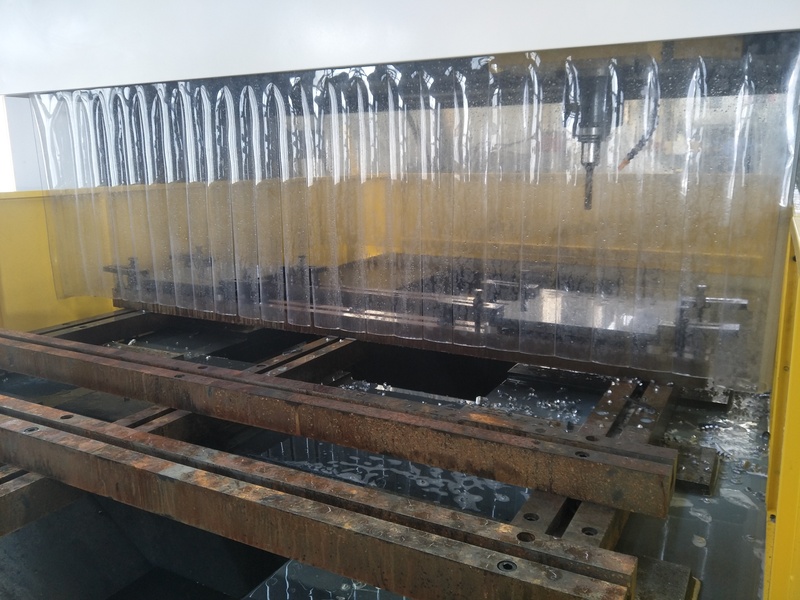 The slides on the cross beam are equipped with vertical CNC feeding ram-type drilling spindle, which adopts special conversion motor with heavy load for spindle. The motor drives the spindle via synchronous belt. The drilling spindle adopts Taiwan precision spindle (inner cooling) with disk spring automatic broach mechanism, hydraulic cylinder loosing cutter, very convenient to change shank. 4. 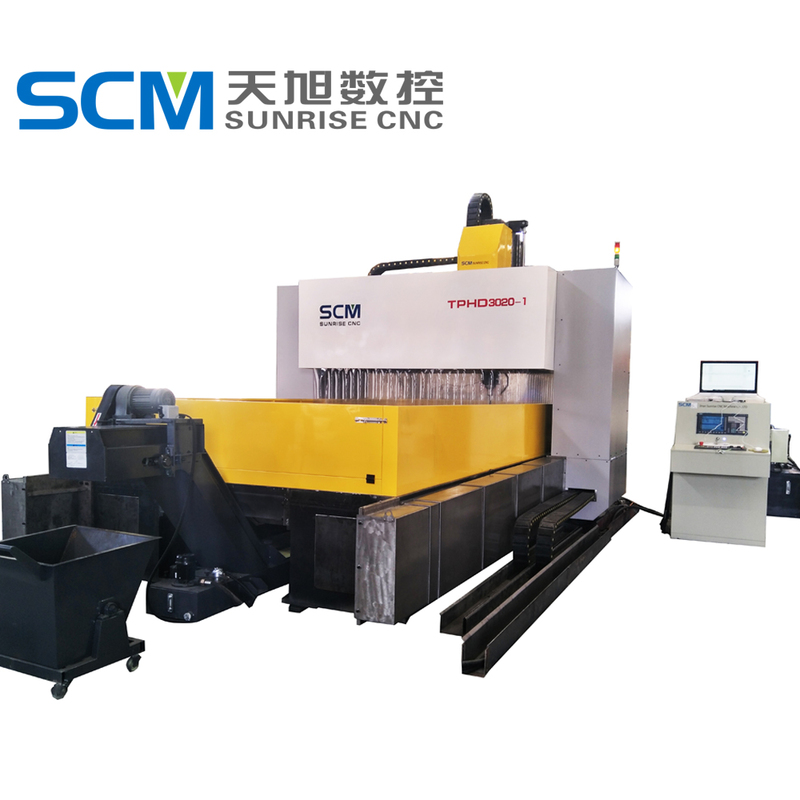 The machine is equipped with hydraulic system to finish the hydraulic balance of vertical ram and hydraulic cutter loosing of spindle. 5. It adopts FAGOR8055 CNC system of Spain or SIEMENS CNC, equipped with RS232 interface and LCD screen. 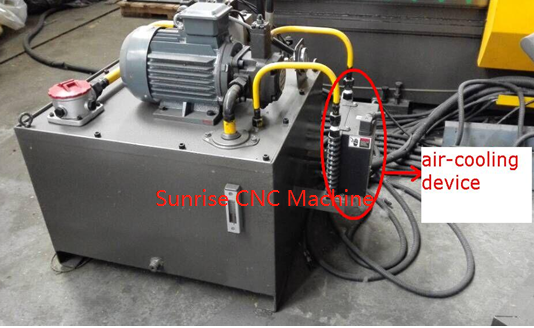 The automatic programming provided can not only generate processing programs automatically, but also preview hole position before drilling. 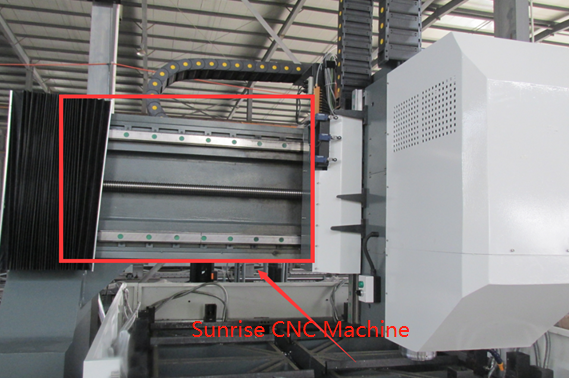 6.It is equipped with chain-plate type automatic chip-conveyor and chip collection trolley. The cooling system is equipped with paper filer, high-pressure inner cooling pump and low-pressure outer-cooling pump, which are used for inner-cooling or outer-cooling of cutter. 7. For ensuring the reliability of the lathe, the key components use high quality imported products. See the main spare parts list for details. 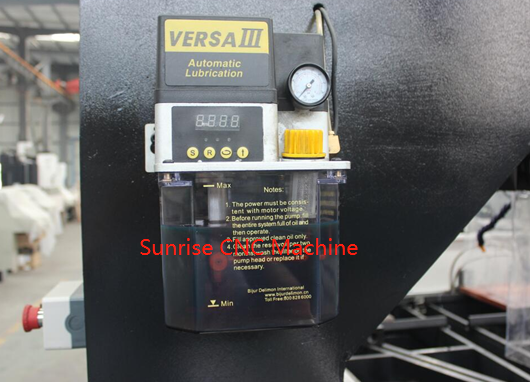 Automatic lubrication system--This system will help lubricate the machine automatically, reduce the workload, provide better care and maintenance for the machine. Drilling-- High speed drilling and high precision, then the production efficiency is very high. 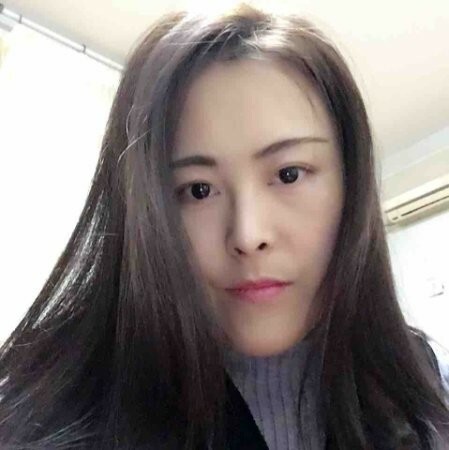 For example, how much time drill one hole, if the hole diameter is φ40, thickness is 40mm, you set the drill speed 1800 rpm/min, cutting speed 0.2mm/r, then the feeding speed is 1800x0.2=360mm/min, drill one hole just need 40÷360≈0.11min (that drill one hole just need 6.6s). Optical edge finder-- We will equip the machine with optical edge finder. Edge finder in CNC machining, is one detection tool in order to accurately identify the workpiece center position. Operational principle of edge finder: first selected one side of the X-axis as zero, then select the Other side, get the draw value, take its half as the X-axis midpoint, then in the same way to find out the origin of the Y-axis, so that the processing center of workpiece in the XY plane will be confirmed.